Just when we thought the OPEN U.P. was the perfect blend for road and offroad riding in one bike, here comes the brand new U.P.P.E.R. with a lighter weight frame, flat mounts for brakes and 12mm front axle to accommodate even more brake and wheel options. Chainring fit: NOTE: For single chainring set-ups, OPEN recommend flat rings, not offset rings, for the best chainline. For "regular" oval rings, deduct 2 teeth from the below spec. For extreme oval rings, who knows. U.P. (Unbeaten Path) and U.P.P.E.R. 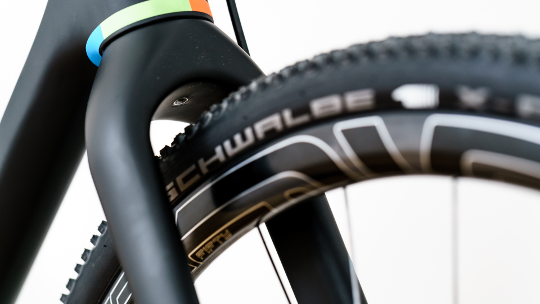 combine a performance-oriented cross/road geometry & parts with clearance for mountain bike tires. So you can ride anywhere, and ride fast. Overall, the U.P. and U.P.P.E.R. 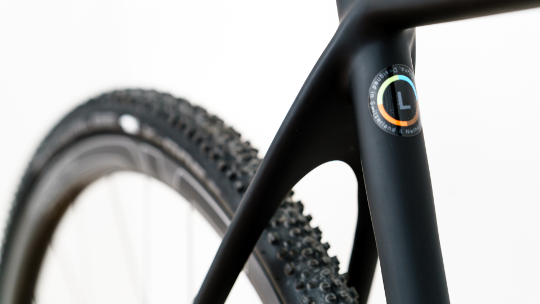 share the same principles of intended use, same tire clearance, same exact shape and geometry. But they differ in layup, weight, fork, disc brake mounts, thru-axles and colour. There is a second reason we designed for 650b and not 29er tires. They would require very long chainstays, while the U.P. now sports a very short 420mm rear end. 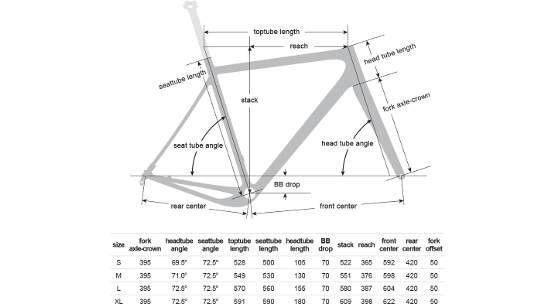 Most gravel and cross bikes have longer chainstays than that yet they can't fit anywhere near the same size of tire. One of the key differences between the U.P. and U.P.P.E.R. is the disc mount standard. The U.P. uses post-mount, whereas the U.P.P.E.R. is designed for flat-mount. We don't like how the bike industry keeps “inventing” new standards, so we always investigate if they are an improvement before we use them. 3. We designed the U-turn, a new fork that accepts flat-mount calipers without the need for that silly adapter. So that disadvantage is eliminated for OPEN. The disadvantage is that you cannot spec the U.P.P.E.R. 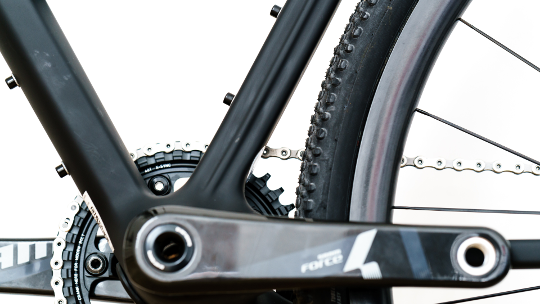 with post-mount brakes, so for example the exotic combination of using XTR mountain bike brakes on the U.P. is not possible on the U.P.P.E.R. One more way we have squeezed some weight out of the U.P.P.E.R. : while the new U-turn fork is set up for 160mm rotors up-front, the frame will accept 140mm rotors in the rear. 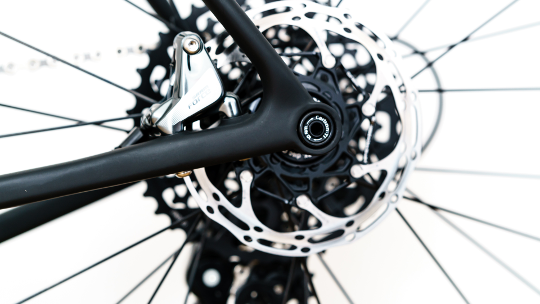 Since it’s the front disc that is the limiting factor in braking, this combination of bigger up-front and smaller in the rear makes a lot of sense and saves 10-20 grams depending on the brand of rotor. If you really want to use 160mm discs in the rear of your U.P.P.E.R., then Shimano and SRAM flat-mount brakes also offers that option with their dedicated adapter (but as you know by now, we’re not big fans of adapters). The U.P. uses the 386 EVO bottom bracket standard. 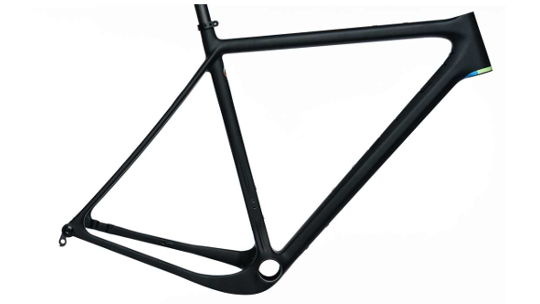 The wide (86mm) BB shell is perfect to attach the dropped drive-side chainstay to. Furthermore, it fits most of the cranks on the market, from Shimano, Campagnolo and SRAM but also smaller brands like THM, Rotor and RaceFace. 386 EVO even allows for the installation of many mountain bike cranks.